Some of us choose to go on vacation in order to get away from the hustle and bustle of everyday life, including the ever-present social media. Some people, apparently, go on social media-themed vacations! I have to admit that when I first saw these social-media themed hotels, I thought I had stumbled onto an article on The Onion. But alas, they really do exist, and I must say that they sound pretty interesting after all. Recently, both Instagram and Twitter themed hotels have opened around the world. The Instagram hotel is located in Sydney, Australia. 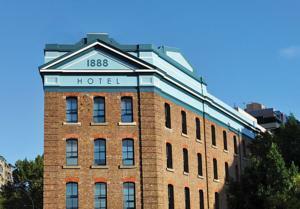 The hotel is called 1888 Hotel, named after the year 1888, the year that the first Kodak camera was introduced. The hotel features Instagram in nearly every aspect of your stay. A digital mural full of Instagram photos graces the lobby. The hotel also provides the perfect place to take a “selfie,” a self-portrait in which you hold your iPhone camera up in order to get the best shot of yourself. A night at the Instagram-themed hotel will run you around $140. But have no fear, if you can’t afford the room rate, Instagrammers with over ten thousand followers can stay a night for free. The hotel also hosts photo competitions in which visitors can win a free night. You can check out photos that guests have taken at 1888 Hotel by searching the #1888Hotel hashtag on Instagram. The new Instagram hotel opens on the heels of the hotel on the Spanish island of Majorca’s Twitter-themed vacation digs. The Sol Wave House uses Twitter in all aspects of the guest experience. The guest rooms are Twitter-themed. Guests can use the hashtag #SocialWave to meet and socialize at the resort. Guests can also use hashtags to make requests of hotel staff – a new way to utilizing social media customer service. The hotel also encourages visitors to share all of their adventures via social networking. They even have a specific app for people to use while on the hotel’s wif-fi network. In addition to Twitter-themed activities, the Sol Wave House also offers some more traditional tourist attractions like a wave pool, beach access, and themed guest rooms. So what’s the lesson to take away from these social media-themed hotels? They encourage, even require, their guests to interact with the business itself by using the #hashtag within social media. With the ability to search Instagram, Twitter, and now the social media giant Facebook by hashtag, it’s important to know how to use it well. By encouraging guests to share experiences with each other and the world by using the hashtag, these hotels are not only making their customers more social media savvy, but also making their business more searchable and thus perhaps more profitable, as well.